TheShop is one of the most demanding and popular Wordpress product and theme for Ecommerce Websites . If you want to open your online store for cloths then this is the best way to explore your market . TheShop wordpress Theme is totally free of cost and anyone can use this adorable and simple theme for his/her wordpress ecommerce website . The Layout of theme is so classic and simple and also very user friendly product by wordpress experts . Theme has also bunch of features like SEO optimized , Mobile friendly and totally responsive for any device . Fast loading Ecommerce theme ever . The design of theme is so elegant and marvellous , its so easy to customize there is no any programming knowledge require to handle this adorable wordpress theme . TheShop Ecommerce Wordpress Theme is fully SEO optimized. Fast Loading speed with simple and adorable design. Easy to Customize and user friendly theme. Useful color options and color scheme , you can set according to you choice. Mobile friendly and fully responsive theme for any device. Image Slide and product slider available to look more attractive. Filter by price also available . you can customize footer widgets for the theme. When the website will load the message "Loading" is also there to get more professional. TheShop Wordpress Ecommerce Wordpress Theme is a free product by wordpress , you can download it from belwo Download Button , if you have some basic knowledge about CSS and HTML then you customize this theme according to your choice and add more features . Download TheShop Wordpress Ecommerce Theme from above Download Button. After Download the Winrar file go to your wordpress Control Panel. 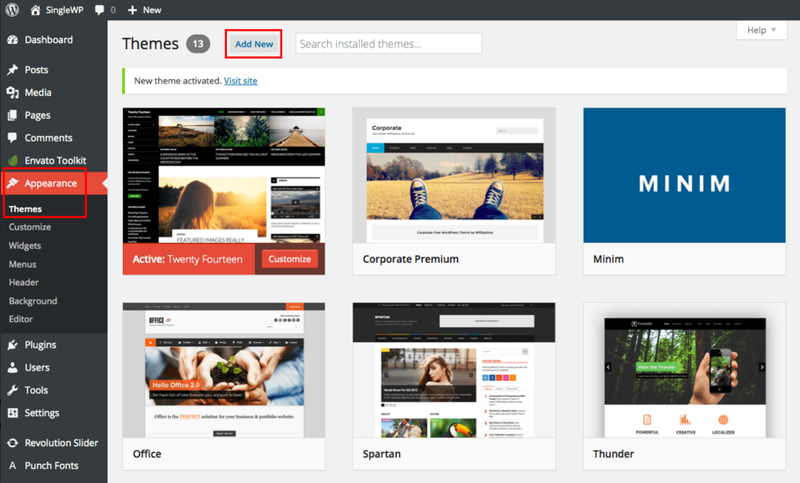 Click on "Appearance" and go inside Themes Section and click on " Add New" . Now Browse and upload your Winrar file which was downloaded earlier . Now Click on Active , you have done enjoy your theme. If you have any issue about Downloading or installing the theme then comment below .